The Dennos Museum will break ground on an addition to its Inuit Gallery in 2016. 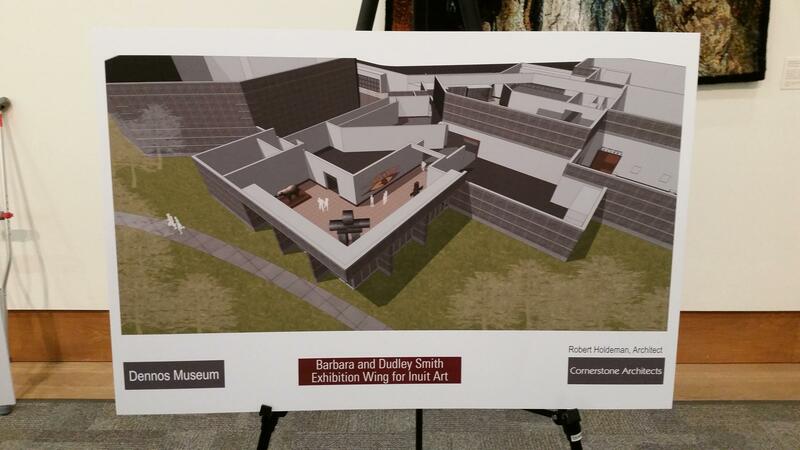 The Dennos Museum Center is expanding its Inuit Gallery thanks to a one million dollar gift from Barbara and Dudley Smith III. Currently, the museum has about 1500 works of Inuit art in its possession. But, because of space limitations the museum is currently only able to showcase around 100 of those pieces. Earlier today, the museum unveiled plans that will add more than 2,600 square feet to the already existing Inuit Gallery. Museum Director Gene Jenneman says it’s the Inuit art collection that gives the museum world-wide acclaim. Building plans are shown for the addition to the Dennos Museum's plans for its Inuit Gallery. 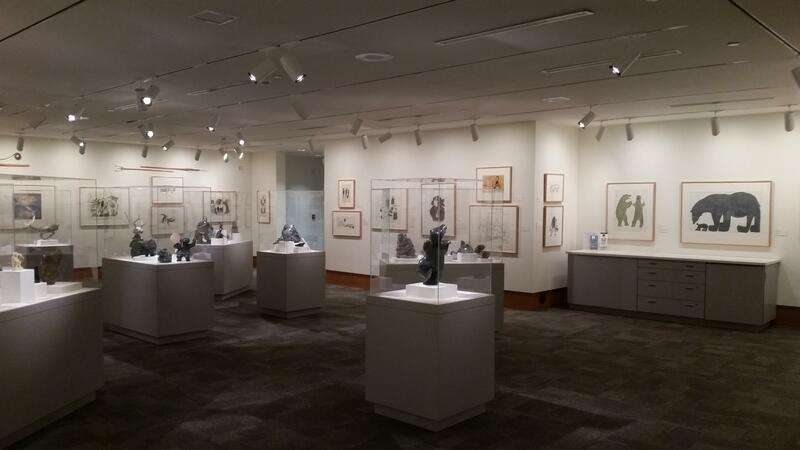 The collection of Inuit art at Northwestern Michigan College started in 1960, with 500 pieces. Since the Dennos Museum opened in 1991, the Inuit collection has tripled in size. Roughly half of the pieces currently in the collection are works on paper, while the other half are stone sculptures. Gene Jenneman says it’s likely that over the next 10-15 years, the collection could even grow by another 1000 pieces of art. But, the museum needs more exhibition space and additional storage to make that happen. Jenneman says it was Canadian artist Jim Houston, who first recognized Inuit art. He traveled to the Arctic Circle in the late 1940s. The Inuit people were nomadic— always following their sources of food. They would make small amulet-sized carvings as part of their religious mysticism. It was Houston who saw those little carvings as works of art that could be sold to support the Inuit peoples. 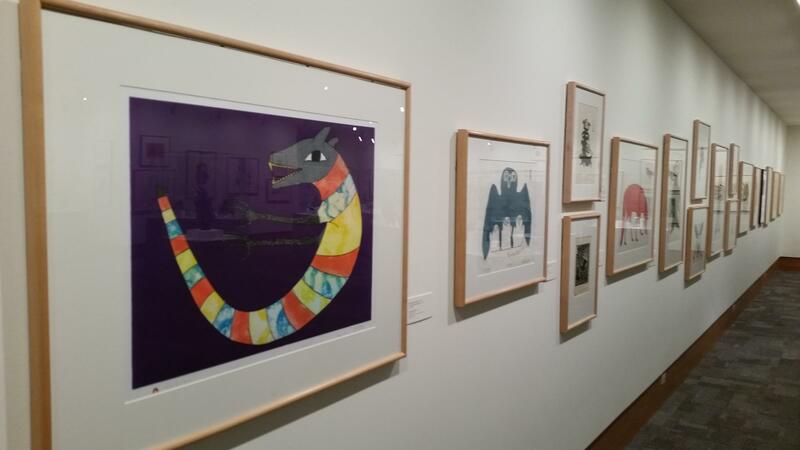 Artwork hangs in the Dennos Museum's current Inuit Gallery. Inuit art came to the Traverse City region in 1960. Eugene Power was a businessman from Traverse City who worked with Jim Houston to introduce Inuit artwork to the United States. Power gave a collection of Inuit art to NMC. The college then sold the artwork and used the proceeds to begin the art collection that exists today. Last night, the Traverse City Commission introduced a new policy on how the city seeks out pieces of public art. Public art has been a touchy subject in Traverse City for years. 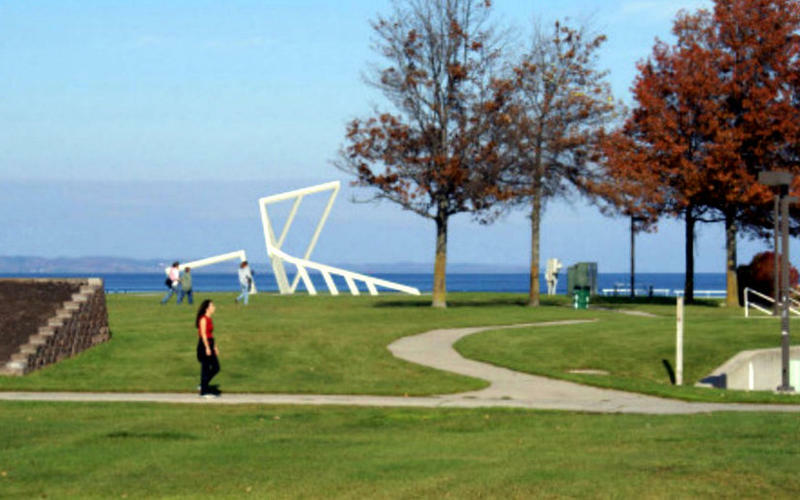 In 2008, public outcry derailed plans to put a modern art sculpture called Time Myth on the shore of Grand Traverse Bay. Time Myth is a 30-foot-tall, angular, white sculpture that’s been displayed in a courtyard at the K-Mart headquarters in Troy. The public conversation about Time Myth quickly deteriorated and the idea was scrapped. NOTE: Monks from the Mystical Arts of Tibet who are in Traverse City this week will also perform at Milliken Auditorium this Saturday, and live on Classical IPR Thursday April 17, in the 10 a.m. hour. The Dennos Museum Center of Northwestern Michigan College is hosting Tibetan Buddhist monks this week. 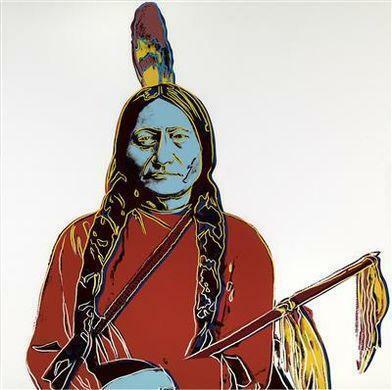 Seven original prints by Andy Warhol were given to Traverse City's Dennos Museum Center this fall. The Dennos' Curator of Education Jason Dake says Warhol intended for small museums to get some of his work.